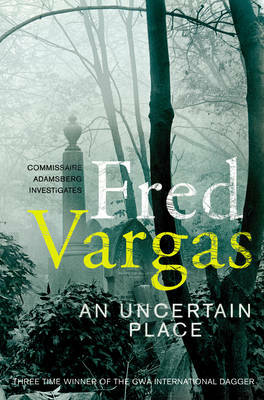 An Uncertain Place is published today. AN UNCERTAIN PLACE was published in French in 2008 and is the seventh in the Commissaire Adamsberg series. English readers almost have a full set of the previous entries with only the fourth instalment yet to be translated. The non-linear translation order has made Adamsberg's romantic-life and his relationship with Camille, who flits in and out of the stories, a little confusing to follow however the later books which are all set close together in time have come out more or less one after the other. The book opens in London, where Adamsberg and two of his colleagues including the human encyclopedia Danglard, are attending a conference. After-hours, one of the English policemen, Radstock, takes his French guests around the neighbourhood which includes Highgate Cemetery. Radstock is horrified to discover a vast number of shoes (with the feet still inside) outside the cemetery. The French delegation return home to Paris shortly after and on the journey Danglard regales his colleagues with tales of the cemetery and its master vampire. Soon though Adamsberg has a new murder case of his own. A semi-retired legal-journalist has been found obliterated in his apartment. The victim was not well liked even by his son and has left most of his fortune to the gardener who is soon suspected, however Adamsberg doesn't think he did it. This investigation begins to go off the rails and as in WASH THIS BLOOD CLEAN FROM MY HAND Adamsberg has to go off the grid and solve the case by himself. The journey takes him to a small village in Serbia, where an old colleague turns up, and also back several centuries to find the seed of the present murderous activity. Vargas has previously covered ghosts, werewolves and plagues so the subject matter of vampires isn't a stretch and though the story is fantastical it has its own well-plotted logic and the most incidental of happenings often proves significant as the story progresses. I have never warmed to the lead character Adamsberg, as I find him a cold creature, but he is surrounded by a cast of unusual and more likeable colleagues such as the aforementioned Danglard, a single parent with a penchant for wine and the redoubtable Retancourt, a goddess in Adamberg's mind. Though over 400 pages long, AN UNCERTAIN PLACE didn't feel quite as meaty or as intricate as some of Vargas's earlier books, but it was still a great pleasure to read, with its excellent translation by Sian Reynolds. The Vargas-Reynolds pairing has already won the CWA International Dagger three times, will 2011 see a fourth? Time will tell. You can read multiple reviews of Vargas's earlier books and get the series's correct order on the Euro Crime website. Fascinating review, Karen. I am just not sure if this book would be my cup of tea, with exaggerated crimes as well as a possible supernatural element, but maybe I should try it. It certainly will be interesting to see how well it does in the Int Dagger competition this year! Very interesting review. Haven't yet caught up with the novel, but it has already been filmed + shown on television in France! France2 is working its way - slowly, alas! - through the Adamsberg series, with a superb cast, faithful and taut script + atmospheric direction = superior entertainment. It does sound as if FV loses in translation. However excellent the translator, working from Fr to Eng is at best a very tough task IMO. In 'real life', FV is an acclaimed medieval archaeologist, so the supernatural is never all that far away (as are historical themes). I agree with you that however good the translations, there is another level of enjoyment reading Vargas in the original. Pity we can't yet see the French tv films, though you can obtain two films on DVD here - Pars vite et reviens tard (Seeds of Death) and Sous les vents de Neptune (book title Wash this blood clean fro my hands)(with subtitles). I would love to see her graphic novel translated though I imagine the market for this is more difficult. Also keen to see the short stories in English, one of which is now a graphic novel too. These all feature Adamsberg and Danglard. Not sure whether the other earlier novels will be translated, particularly the first which Vargas's considers is too autobiographical and of lesser quality than later novels. I am waiting for the next one in French, now that the Battisti case against extradition to Italy from Brazil has been settled. I have to say that I really enjoy this series, beginning with "The Chalk Circle Man." Vargas is a brilliant writer, and her plots (in my opinion) are wholly original and completely unpredictable. My copy of AN UNCERTAIN PLACE arrived in the mail last week. I can't wait to dive in!